Sadly, I don’t buy picture books any more because my kids think they are way too old for them now. So it was a pleasure to browse some lovely books in a couple of bookshops to see the latest in picture books. Koala Bare, written by Jackie French and illustrated by Matt Shanks – this koala has attitude with a capital A. He’s also on a mission to explain that he is a koala, not a koala bear. Kids will love the beautiful simple illustrations with lots of white space, and the cheekiness of this koala with a strong voice. Koala goes through the different types of bears and explains why koalas are superior to them all, and why he is not one of them. Perfect for two-four year-olds. Madeline Finn and the library dog, written and illustrated by Lisa Papp – Madeline Finn does not like to read, and avoids it at home and school. But she really wants her teacher to give her a star like the other kids who read well at school. Usually, she receives heart with messages like, Keep trying! One day, her mum takes her to the library, and the librarian introduces her to one of the library dogs. Reading to Bonnie is not like reading to anyone else, and slowly but surely, Madeline becomes a reader. This would be a perfect gift for a child starting school next year – not preachy at all. Mouse House, written and illustrated by John Burningham – kinder kids will love this story about a mouse family living unseen in a human family’s house. The little mice know they must never allow themselves to be seen by humans. Yet, a boy catches sight of a mouse and tells his father. The children and the mice are all of a sudden united in their efforts to help the mouse family escape from the exterminator. 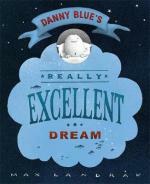 Danny Blue’s really excellent dream, written and illustrated by Max Landrak – Danny’s world – and everyone else’s – is blue. But one night Danny has a dream which has red in it. His father, a paint shop owner, dismisses it but Danny is keen to replicate this unknown colour. After a few trial and error attempts, he creates an amazing shade of red. No one is impressed initially, but then red starts popping up everywhere. Danny wants to call the paint colour ‘really excellent dream’ but it’s a long name for a paint colour. So it’s shortened to R.E.D. Four-five year-old kids will appreciate the humour, and the little words which relate to the pictures. La la la, written by Kate DiCamillo, illustrated by Jaime Kim – so there might only be one word – repeated and repeated and repeated – in this picture book but don’t be deceived by this simplicity. There is a story around this word, and the gorgeous illustrations bring a little girl’s need for connection to life. The poesy ring, written and illustrated by Bob Graeme – this book follows the history of a ring, which is moved from field to ocean to city by animals and humans. A beautiful book to encourage imaginative thinking and questioning. Story cubes – although these obviously aren’t a book, story cubes are a fabulous way to encourage imaginative storytelling. I found these ones at Dymocks. We have a set at home which I used to keep in my bag at all times. Perfect for when you’re waiting for an appointment, out to dinner or even in the car. The cubes have pictures which makes it a good game for three-five year-olds. Older kids can make up more elaborate stories while little ones can tell a story based on one picture with a couple of sentences. And your job is to ask ‘why’! There are also other ideas for picture books in my posts here, here, here, here and here, including fairy tale picture books. Thanks Karen. I’ve been waiting for this post. I think Kosla Bare has got my vote. I also like the idea of the story cubes. I hope this post gives you lots of ideas, Kathy!